I always had a thought of serving a diet friendly platter with an unique recipes for my family members and this 100 days diet recipes challenge made my dreams come true. The above pic is a complete healthy, nutritious and guilt free breakfast platter. My main theme of this platter is prove that breakfast can also be eaten as king without guilt during dieting days. 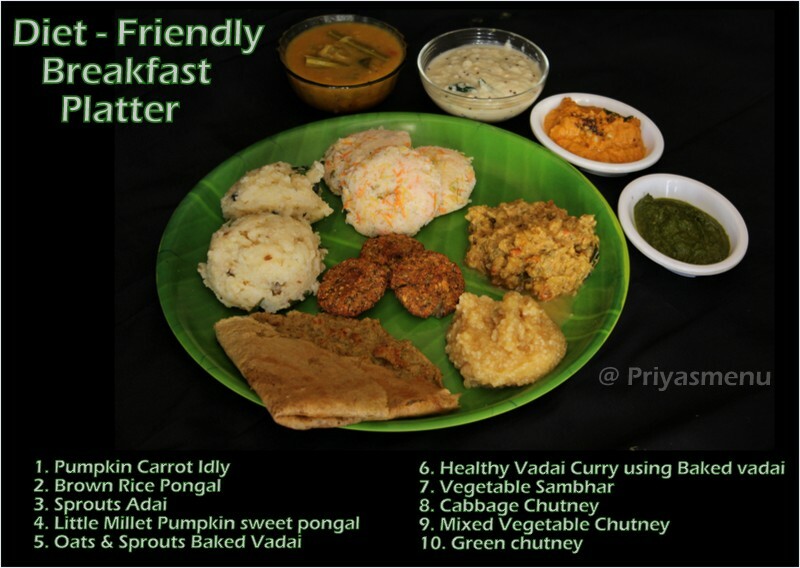 There are lots more in diet recipes which can be served for breakfast but this is just a sample. As I had already posted recipes of the remaining dishes, posting a healthy and nutritious idly as my 99th post. Pumpkin and Carrot Idly is a tasty and healthy breakfast option prepared using brown rice and millet batter. I have used kudo millet / Varagu in this recipe which can also be replaced with any other millet or mixed millets. Millets are the best option to consume during diet days instead of regular rice as it is gluten free and they are the natural source of protein and iron. If you find it very difficult to consume as rice, just include millets in other ways like idly, dosa, upma, pongal etc where rice is included. Wash and soak millet and brown rice together in a bowl. Wash and soak urad dal and methi seeds together in a bowl. Soak all the ingredients for 5 - 6 hours. Transfer it to a bowl and grind millet - brown rice into smooth batter. Mix both the batter, add salt and let it ferment over night. Once done, mix well and measure 1 1/2 cups of batter for pumpkin & Carrot Idly. Once it starts spluttering, add jeera seeds followed by channa dal, finely chopped green chillies and a pinch of hing powder. Add the grated pumpkin and carrot to the thalimpu. Cool the mixture and add the measured batter along with the required amount of salt. Grease the idly moulds and fill it with pumpkin & carrot batter. De mould the idlis using wet spoon and transfer it to a bowl.